Tillie Miller Park is located at 102 Northwest Ave F. Amenities include children’s play area, tennis courts, basketball courts, picnic pavilion, and restrooms. Great Place to have birthday parties or just a day of fun in the park with your kids. George Sands Park is located on Highway 98, across from the Dollar General. Amenities include children’s play area, walking paths and a pond with a fountain. A perfect place to have a picnic or birthday party! John David Patton Wildlife Park is located north of Carrabelle on Highway 67. Amenities include nature trails, educational signage, picnic facilities and restrooms. This park offers bird watchers and nature enthusiast a perfect place to relax. Carrabelle Veterans’ Park is located on Highway 98 in the center of Carrabelle. Come and pay your respects to the Veterans of Carrabelle. 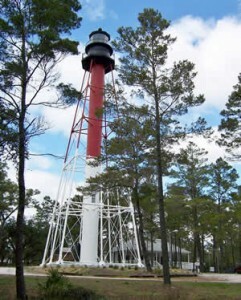 Crooked River Lighthouse Park is located west of Carrabelle at Carrabelle Beach. Amenities include Historical Working Lighthouse, Children’s Playground featuring 70 foot Pirate Ship, picnic facilities. The Keeper’s House Museum and Gift Shop is open from noon to 5:00 p.m. Thursday through Sunday. Weather permitting, you can climb the Crooked River Lighthouse on Saturdays and Sundays from 1:00 p.m. till 4:00p.m. All climbers must be 44 inches tall.